At long last, our crew (and our new boat) have arrived home to Maui…! 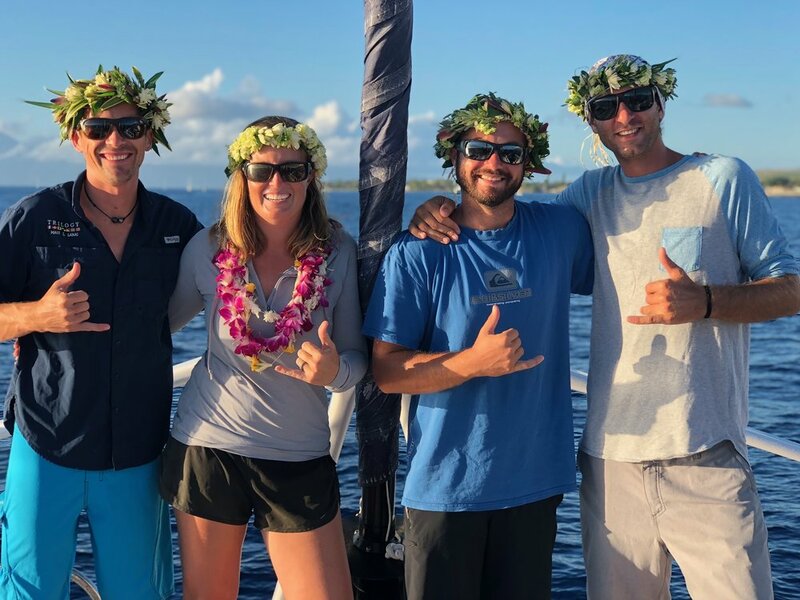 Read Captain Denver’s final blog, detailing the last few days of their open ocean voyage, and their triumphant sail into Lahaina! Trilogy IV and her crew arrived safely to the protected waters of Hilo Bay on Wednesday, November 7th, just before sunset. This marked the end of a twenty day and eight hour passage which covered over 5,000 nautical miles of the Pacific Ocean. Just prior to landfall, the final days aboard Trilogy IV consisted of off-the-wind sailing, and saw Trilogy IV reaching top speeds of just over 18 knots! While surfing down the face of Open Ocean swells, the crew were blessed with starry nights (sans light pollution) and final moments of crew bonding before the fast pace of life on land would turn this incredible crossing journey into a distant memory. However, after almost three weeks at sea, dwindling food and fuel supplies, and only a few marine animals and sea birds for entertainment, I think that all of us were pretty excited when we spotted the faint outline of Mauna Loa! The land-spotting was then followed by the sounds of cellphone chimes and pings as we came within cellular range. While it was great to talk with friends & family to finally let them know that we were all safe and had arrived, (not to mention a nice google splurge session for questions that had come up on the crossing), I will miss the simplicity that the sea brings. It is nice to wake up and know that your only concerns for the day are how strong the wind is, what to eat, wondering if it will rain, and which book to read. We were forced to douse the sails and motor the last thirty miles to Hilo Bay, as the wind calmed significantly. However, we were able to pull into the harbor just before dark and settle in for our first full night of sleep in three weeks. The next morning we fueled the boat, checked in with U.S. Customs, and headed toward Maui with clear skies and glassy seas. The north shore of the Big Island gave us a show, with thirty miles of waterfalls and deep valleys and making for an epic final day aboard Trilogy IV. It was especially amazing when we pulled into Waimanu Bay and were greeted with a large pod of spinner dolphins which proceeded to hang around the boat for the next thirty minutes. We then headed out into the Alenuihaha channel between Maui and the Big Island with a light following wind. At exactly 4pm, we arrived at Lahaina Harbor and were greeted by our friends, family, and of course, the Trilogy Ohana! Champagne was popped, leis were laid, and everyone had fun checking out the beautiful new addition to the Trilogy fleet. After all the fun was over, it was time for Kai, Katie, Nick, and myself to pack our bags and say good-bye to our home for the past few weeks. It was a bittersweet farewell knowing that the next time we would sail aboard Trilogy IV would likely be on a Discover Lana’i tour, and not across the Open Ocean. With so many miles covered with so few problems, the entire Trilogy crew who helped bring the boat from St. Croix should be incredibly happy with such a successful delivery. While it is unlikely that future adventures at sea will go this smoothly, as they rarely do, this one should be remembered fondly. I am grateful for the time I was able to spend getting to know some of our best captains around, and for getting to share such an amazing experience with them. Trilogy IV is an amazing boat and I hope our future passengers enjoy sailing aboard her as much as we did! The full Trilogy IV 2018 Crossing Crew, after arriving home to Maui! Below, from left to right, Captain Raquel, Captain Denver, Captain Katie, Captain Kai, Captain Nick, and first-mate Lowell.